StayWell and the American Lung Association are proud to introduce Freedom From Smoking® Plus. It’s a highly-interactive online behavior change program that addresses today’s mobile lifestyles. It works on desktops, laptops, tablets and smartphones and includes telephone, chat and email support from trained tobacco cessation counselors. What makes Freedom From Smoking® Plus so different? 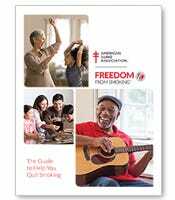 Freedom From Smoking® The Guide to Help You Quit Smoking is an interactive 64-page workbook that addresses the difficulties of quitting with real-life activities and an innovative graphic approach that enhances learning. Small in-person group setting (up to 16 employees) offers personalized attention and peer support. For more information, call your local American Lung Association office or visit Lung.org/ffs today.